Functionality and simple design combined with high quality: these are the distinguishing features of the BEAUTY CARE INSTRUMENTS series. With these solid beauty tools, kai offers the perfect basis for impeccable nail care. Specific applications for the perfect manicure and pedicure are easily covered by the wide range of scissors, nail clippers and cuticle nippers. The wide selection of compact sets in the BEAUTY CARE INSTRUMENTS series makes them also essential travel companions. 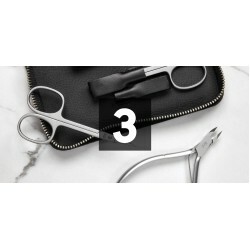 Cuticle Scissors with tower point, stainless steel (45 x 90 mm)..
Nail Scissors with microserration, stainless steel (45 x 100 mm)..
Nail Scissors with tower point, stainless steel (45 x 90 mm)..
Nail & Acrylic NipperJaw 8.0 ± 0.5 mm, stainless steel, lockable, round box joint (48 x 105 mm)..
Cuticle NipperQuarter Jaw 12 (4.0 ∼ 5.0 mm), stainless steel, lap joint (48 x 105мм)..
Cuticle NipperHalf Jaw 14 (5.0 ∼ 6.0 mm), stainless steel, lap joint (48 x 105мм)..
Cuticle NipperQuarter Jaw 12 (4.0 ∼ 5.0 mm), stainless steel, round box joint..
Cuticle NipperHalf Jaw 14 (5.0 ∼ 6.0 mm), stainless steel, round box joint (48 x 105мм)..
Nail File, stainless steel, grit 120/280 (10 x 95mm)..
3-piece: nail scissors, nail file & tweezers, stainless steel in nappa leather case (52 x 100 mm..
3-piece: nail clippers, nail file & tweezers, stainless steel in nappa leather case (52 x 100 mm..